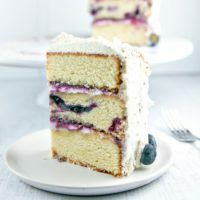 A three-layer vanilla cake with blueberry cardamom curd filling, all and covered with whipped cream. Simple flavors combine to make a spectacular dessert! 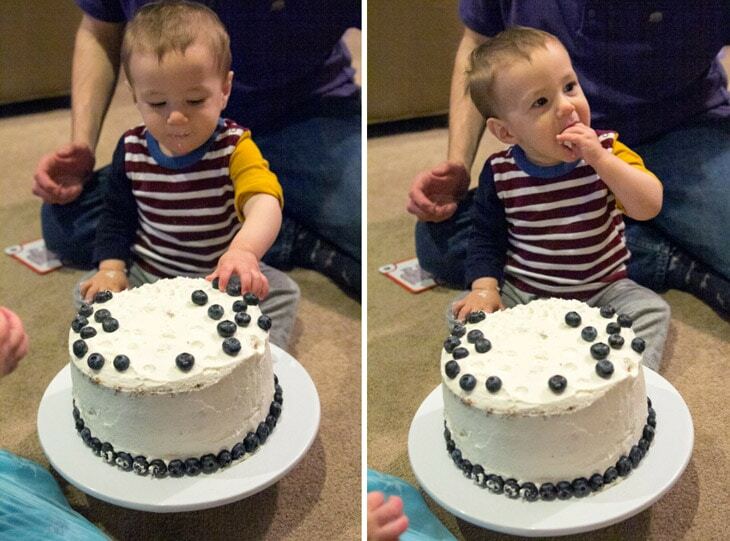 Six weeks ago, my little boy celebrated his first birthday. An entire year – on one hand, it’s hard to believe that it’s been an entire year. Wasn’t he just born yesterday? On the other hand, it’s hard to believe that it’s only been a year. It feels like he’s been a part of our lives forever. We spent his actual birthday on a little trip to Nashville. His birthday started out with a 100-layer doughnut from Five Daughter’s Bakery and we let him try his very first bite of ice cream at Jeni’s Splended Ice Cream. Although we opted to not have a first birthday party for him, what kind of baking-loving mother would I be if I let his first birthday come and go without baking him a birthday cake? Despite still having no teeth, Ryan eats and loves everything, thanks to baby led weaning. 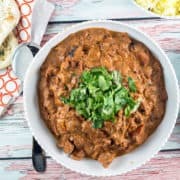 And by everything, I truly mean everything — from spicy curries and chilis to okra and broccoli rabe. But his favorite food of them all is blueberries. We give him some berries after dinner every night, and he starts waving his hands and squealing in excitement if the blueberries appear. 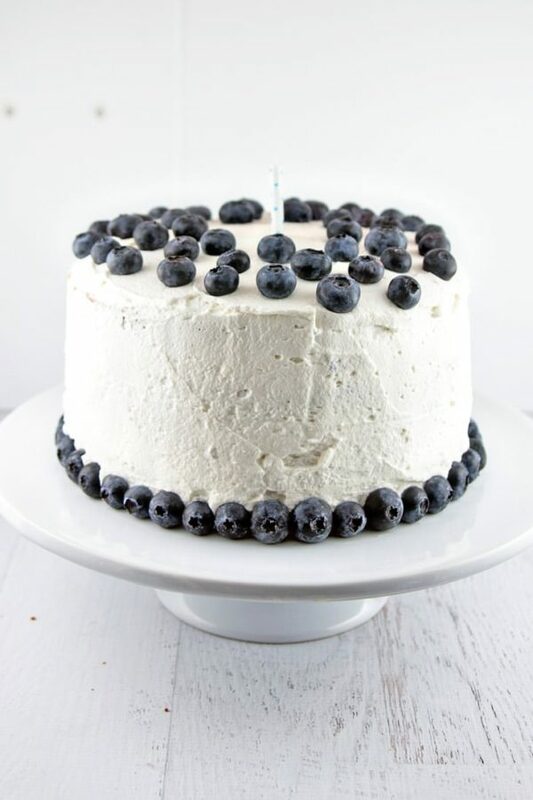 As it just so happens, blueberries are one of my favorite foods as well (the apple doesn’t fall far from the tree, apparently), and since blueberries work so well in baked goods, his birthday cake choice seemed pretty obvious. Two weeks ago, I shared a recipe for a smooth, creamy, vibrantly purple blueberry cardamom curd. 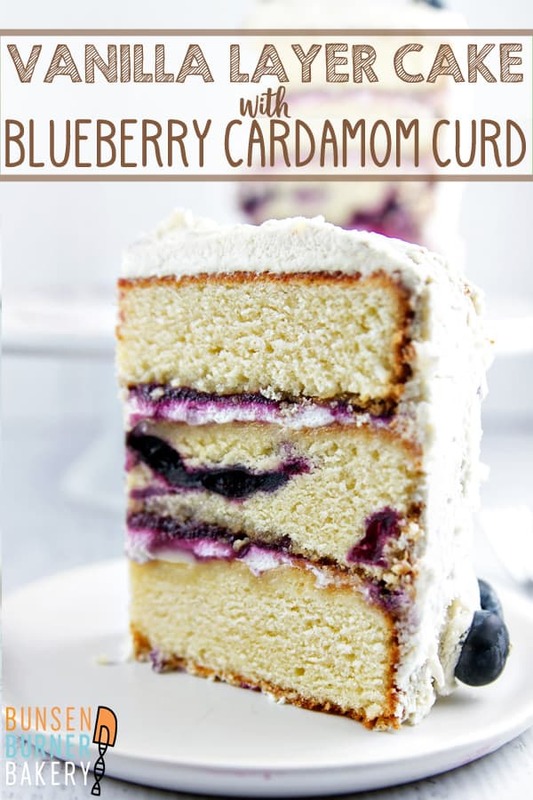 This curd just so happened to star in Ryan’s first birthday cake: three fluffy layers of blueberry vanilla cake with blueberry cardamom curd in between, covered in fluffy white whipped cream. 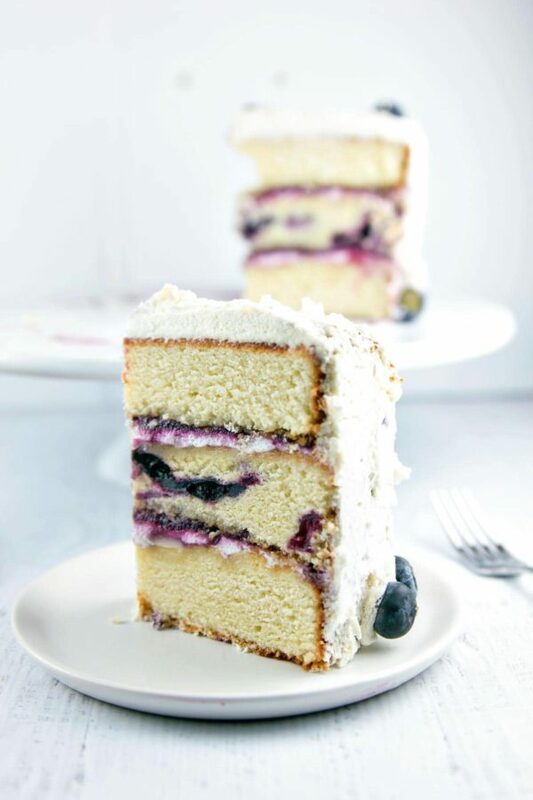 My favorite vanilla layer cake — the perfect combination of buttery and rich, airy and sweet, one layer baked with an abundance of blueberries — with layers of blueberry cardamom curd and freshly whipped cream, covered with another layer of whipped cream. It’s amazing how such simple flavors combine into something truly spectacular. White vanilla cakes often just use egg whites to keep the cake whiter in color, but the yolks add such a richness, it’s well worth the tradeoff. We’ll use whole eggs here. We’re also going to use both butter (for flavor) and oil (for an extra moist crumb). Because we’re covering this cake with whipped cream, we need to store it in the refrigerator. We want the extra moisture from the oil to help prevent the cake from drying out too much in the fridge! Do your cake layers always dome, with the middle rising higher than the outside? Want to know how to stop this and get perfectly flat layers every time? First, we need to understand why this happens — it’s time for a little kitchen chemistry! Cakes dome because of simple thermodynamics: the batter along the edges of the pan get hotter than the batter in the middle of the pan. As the batter heats, it loses moisture, and once enough moisture is lost the cake sets and stops rising. The batter along the outside of the cake gets hot faster, since it against the edges of the metal pan, and it rises and sets quickly. The batter in the middle of the pan, however, is more insulated, and thus heats slower, continuing to rise far longer than the batter along the edges. Now that we know the why behind cake doming, how to we prevent it? Easy: we just need to insulate the outside of the cake so it heats at the same rate as the inside of the cake! To achieve this, I always use insulating cake strips — you soak them in water first, wrap around the cake, and it prevents the outside of the cake from getting too hot. Easy peasy! Worried about making a cake with slippery curd layers? Don’t be. Truth time: this cake is a little messy to make. Just look above at that curd squishing out the sides! But don’t worry, we’ll frost the cake with a crumb layer of whipped cream, which stops all that curd from running down the side. The crumb coat is especially important since, as you can see, the sides of the cake are a little bit crumbly. This is because of the insulated baking strips — the outside of the cake doesn’t get quite as nice of a crust since the outside edges of the pan aren’t as hot. In the give and take of cake baking, I’d rather have slightly crumby edges than domed cakes. 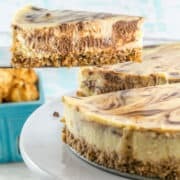 After all, a quick crumb coat (covering with a light layer of frosting, refrigerating to set, and then doing a second layer of frosting) is an easy fix! As far as the curd that does spill out before you frost it? Grab a spoon and dig in — this is a seriously delicious mess. Use the full amount of sugar and cream well with the butter. 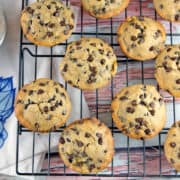 Lots of desserts have more sugar than necessary; one of the first things I often test with my recipes is reducing the sugar. But for this cake, the full volume of sugar really is necessary for the structure of the cake. We want the sugar and butter to be light and fluffy, so cream it for a good 3 to 4 minutes, until it’s pale yellow in color and well-whipped. For perfectly level cake tops, use insulating baking strips. 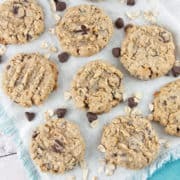 No baking strips? Just be prepared to level the baked cake with a knife before frosting. Pre-chill the bowl before whipping the heavy cream. This isn’t necessary, but the process will go faster if the cream is kept cold! Start with a crumb coat — a thin layer of the frosting — and refrigerate. 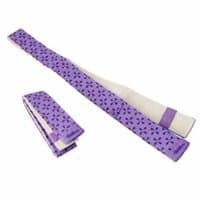 This will both help hold any crumbs from the side of the cake and keep the blueberry curd in place so it doesn’t tint the whipped cream blue. After chilling, add an additional thicker layer of the whipped cream. And how about the birthday boy? Well, they say a picture is worth a thousand words. It’s safe to say that he liked it, even if he was most interested in picking off all the blueberries from the outside and licking the blueberry curd. I know his tastes will change, but I hope he lets me make this cake again for the next few years. And maybe someday, we’ll trade off and he’ll start making this for my birthday. 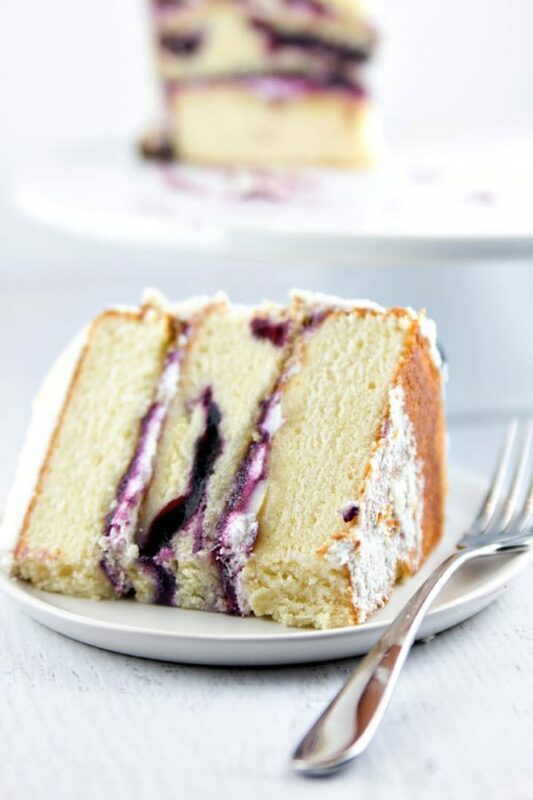 A three-layer blueberry vanilla cake filled with blueberry cardamom curd and covered with whipped cream. Simple flavors combine to make a spectacular dessert! Preheat oven to 350°F. 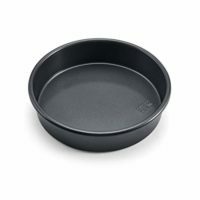 Line three 8-inch round cake pans with parchment paper, then spray parchment paper with nonstick baking spray. In the bowl of an electric mixer, beat together the butter and sugar until light and fluffy, 3 to 4 minutes. Beat in the eggs, one at a time, followed by the vegetable oil. In a small bowl, stir together the flour, baking powder, and salt. Add half of this mixture to the butter and eggs and beat until just combined. Pour in the milk and 1 tablespoon of the vanilla extract, mix to combine, and follow with the remaining flour. Beat until just combined and no lumps remain. Divide the cake batter between the three prepared pans (batter will be thick). Add blueberries to one of the pans, gently pushing the blueberries down into the batter. Bake for 35-40 minutes, until a tester inserted into the center comes out with a moist crumb. Remove from the oven, allow to cool in the cake pans for 5 minutes, then turn out onto a wire rack to cool completely. While cakes are cooling, prepare the whipped cream. Add the cream to a large, cold mixing bowl. Using an electric mixer with the whisk attachment, beat at medium speed until the cream begins to thicken. 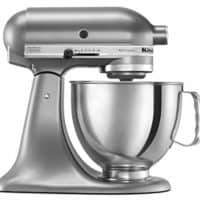 Add the confectioners sugar and remaining tablespoon of vanilla extract to the bowl, then increase the speed to medium high and continue to whisk until the cream holds a stiff peak, an additional 5-7 minutes. Spread a thin layer of whipped cream on the bottom of a cake plate to help prevent the cake from sliding. 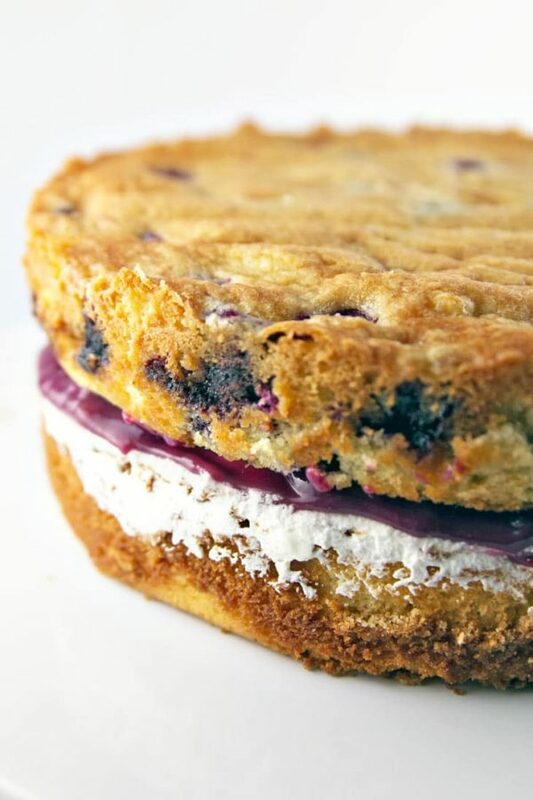 Place a plain layer of vanilla cake on the bottom, spread a thin layer of whipped cream on top, and add half of the blueberry curd. 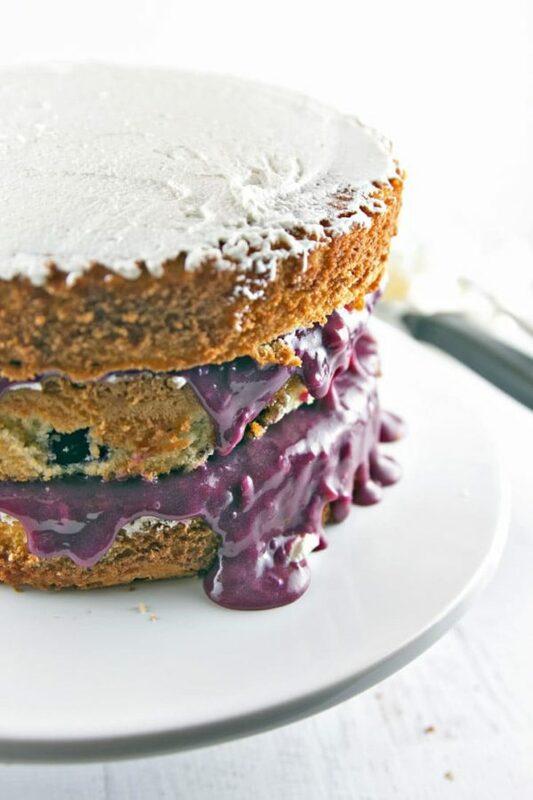 Repeat with the blueberry layer of cake, followed by topping with a plain layer of cake. Spread a thin layer of whipped cream along the sides of the cake. Blueberry curd will leak out and the whipped cream will tint purple — don’t worry! This will be covered. Add a thin layer of whipped cream to the top of the cake and refrigerate for 30 minutes. Remove the cake from the refrigerator and use the remaining whipped cream to cover the sides and top of the cake. Decorate with additional blueberries as desired. Refrigerate cake until serving. Thanks, Jolina! 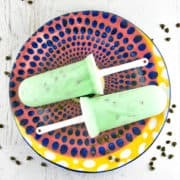 Cardamom is one of my favorite flavors – it’s so versatile. Delicious in everything from cookies to savory spice rubs (and of course, curd!). You’re so lucky to have a niece and nephew. My husband and I are both only children, so we’ll never have any nieces or nephews to spoil and Ryan has no aunts or uncles! This cake looks amazing! Your son has great tastes ? Happy birthday to him! I can’t wait to try this cake myself! It doesn’t say how much sugar it needs, can you tell us please? Now that’s seriously weird – the amount of sugar showed up on the mobile version, but not on desktop. 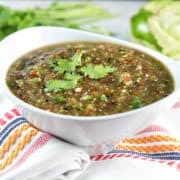 I have no idea what’s going on with my recipe plugin! I deleted everything and rewrote it, and it looks like it’s showing up on both, but just in case it isn’t — there are 3 cups of sugar in the cake. Thanks for letting me know it was missing! The cake looks delicious! What can I use instead of vegetable shortening? Hi Shahana — Generally speaking, butter can be used at the same ratio to substitute for shortening, although there is a different moisture content, so the overall end texture of the cake may change a little. I might also be tempted to try subbing in coconut oil for the shortening (also at the same ratio), but I haven’t tried this before. Butter is the safest swap, but I haven’t personally tried it out myself so I can’t speak to the exact structural changes to the cake. I’m sure it will still be delicious, though! This cake looks delicious. Can’t wait to make it for a friends upcoming birthday. I have not used whipped cream for frosting before. Can I frost the cake hours before the party or does it have to be done close to serving time? Also, how long will it keep? Thank you. Thanks, Cathy! You can frost the cake ahead of time — I did mine around 10am, and the pictures were taken around 7pm. You’ll want to whip the frosting until the peaks are stiff, so more firm than CoolWhip or canned whipped cream consistency – think more like a buttercream frosting. Since the frosting is whipped cream, the cake needs to be refrigerated. It will keep uncut for a day or two and still be delicious, but once it’s cut the cake tends to dry out fairly quickly in the fridge. If you don’t mind squishing the frosting, you can wrap the leftover slices of cake tightly in plastic wrap, which will help prevent the cake from drying out. Those are such beautiful layers. The ratio is just perfect. I can never get those right! Ha, thanks Manju. Mine are often off, too – I’m terrible at evenly leveling cakes! 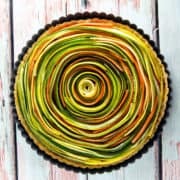 What a delicious looking cake I love the addition of cardamom its one of my favourite spices. One of my favorite, too! Happy birthday to your cute little one! That cake looks lovely, particularly love the curd recipe! That’s one lucky birthday girl! Great looking cake and cardamom is an interesting addition. This is seriously a glorious cake! 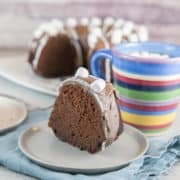 This just made me crave a bite of this cake!! Looks so yummy.Happy birthday to your son!! I only have 9″ cake pans. Do I need to adjust the recipe? Or will the layers be ok slightly thinner? This is beautiful! I would never have imagined blueberry curd, so I’m glad I came across your recipe. I recently made a coconut layer cake with pineapple curd that also squished out the sides of the cake, despite carefully thickening and chilling everything in advance. I made a mental note to consider carving out a little divot in the top of the two bottom layers for the curd next time–kind of like the tops of those prefab strawberry shortcakes. Or maybe we need to invent a custom cake pan just for cakes with delicious fillings like this! Mmmm curd. Pineapple curd sounds AMAZING! I’ve learned a thing or two about cake filling since this post — what you’re actually supposed to do is pipe a thick ring of frosting around each layer, and then fill the inside with curd. The frosting prevents it from squishing out the sides!